In my experience, there are two types of first days when it comes to a job or internship. The first type is the typical training day where you get acclimated to the environment, maybe read a thick employee manual, and learn everyone’s names. While this might not be the most thrilling day of your job, it’s crucial in adjusting to a new position. The second type of first day is more exciting. You go in and after a few brief introductions you’re thrown into the fast-paced rhythm of the business just like everyone else. 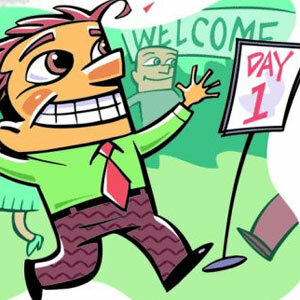 While this type of first day is arguably more desirable, it can also be fairly overwhelming. The first day at my summer internship was the exciting one. I was there for half an hour and then was hustling to a press conference, researching press coverage, and writing a press release. I was thrilled to be given responsibility on the first day but I was also so nervous that I had to constantly remind myself to take deep breaths and calm down. Overall the day went really well and I learned a lot from it. Write everything down. Whether it is names, assignments, or directions, it helps to have something to refer back to. Don’t be afraid to ask for help. No one expects you to know everything, especially not on the first day. Be confident! You have experience, even if it’s only learning from a textbook. You’re more prepared than you think. What advice do you have for the first day of a new job or internship? Share with us!